The opposition in Madagascar on Monday said it was shunning a UN special envoy who is trying to broker an end to a political crisis ahead of a general election. “Let the Madagascans speak to each other,” opposition member of parliament Hanitriniaina Razafimanantsoa told protesters gathering for the 17th straight day in the capital Antananarivo. “For the moment this is a crisis that must be discussed between Madagascans and resolved by Madagascans,” he said. Since April 21, hundreds of opposition supporters have occupied the May 13 Square in the heart of the capital, seeking the resignation of President Hery Rajaonarimampianina before general elections seven months away. The opposition says the electoral laws are loaded in Rajaonarimampianina’s favour and accuses the government of trying to elbow them out of the race. The country’s top court last week tossed out parts of controversial new electoral legislation that had sparked the protests which claimed at least two lives. But the opposition has decided to continue the protests until the constitutional court decides on its recently-filed petition seeking the removal of the head of state. Abdoulaye Bathily, a special advisor of the UN Secretary General arrived in Madagascar on Sunday to try to renew dialogue between the opposition and the ruling party. He held talks with president Rajaonarimampianina on Sunday. “The solution lies in the hands of the Madagascans, we just want to accompany them in this process,” said Bathily. 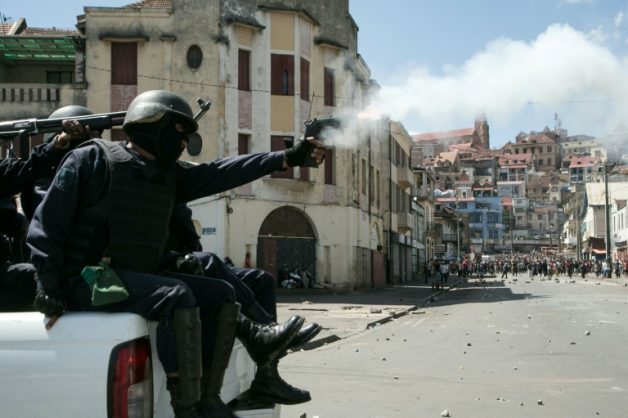 The opposition has, however, agreed to hold talks with the World Council of Churches in Madagascar, which has also offered to help find a way out of the crisis. Elected in 2013, Rajaonarimampianina has not yet announced whether he will stand for re-election in a country that has been politically volatile since the last years in office of former Marxist military ruler Didier Ratsiraka, voted out in 2001. Two ex-heads of state and onetime mayors of the capital have already said they will stand: Marc Ravalomanana, who was president from 2002 to 2009, and Andry Rajoelina, who removed Ravalomanana after mass public protests and an army mutiny. Both were barred from running in 2013 and their parties have been involved in the demonstrations, but the two men have since made common cause against the current regime.